At the end of July last year I posted this photograph from Jimmy Wood’s photo album of the Banks crew. The photograph had caused me a degree of frustration because (at the time) I couldn’t understand the presence of the individual stood up behind Jock Fraser and Maurice Wiggins. A signature ‘J. B. Mossman’ seemed to make no sense to me – research indicating that this individual was possibly F/Sgt John Edward Barry Mossman, RNZAF NZ42112587, Wireless Operator with Wi Rangiuaia’s crew. I was also vexed by a second signature which seemed to read ‘Ted Smith ‘Hop Head” – this signature seemed all the more strange as it was next to Jack Britnell….. I am pleased to report that my wonderings have been, at least partly answered. I have been contacted by John and Matt, Son and Nephew respectively of John ‘Ted’ Smith, Rear Gunner with the Milsom crew and latterly also it would appear, with the Banks crew…..Many thanks also to them for supplying some fantastic pictures of Ted, both from the War period and before it. 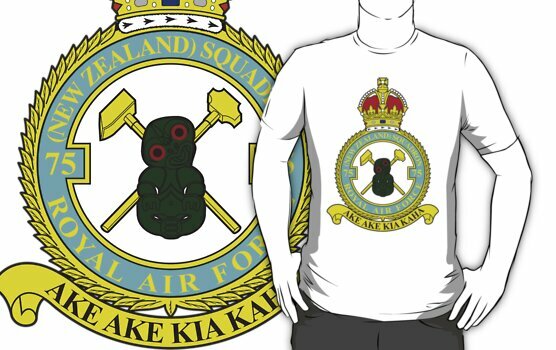 Read my original post about the Milsom crew here. Clearly in hindsight, a fundamental mistake I was making was to assume that the individual next to the signature ‘Ted Smith’ was Jack Britnell – obviously, I now understand it was Ted! I have become acutely aware, that errors do exist in the ORB’s and the problem I suppose I and others have is that we have to take what is recorded in them on face value. 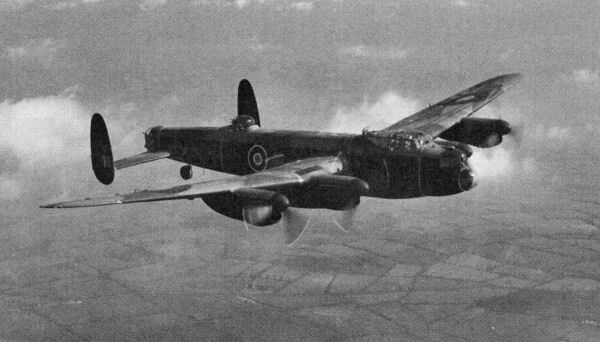 If I take my own knowledge of the Zinzan crew, I know that 2 entries concerning the identity of the Air Bomber are incorrect – Dad flew these 2 Ops, but the ORB’s list another individual for one and someone with the same surname for the other – its only because I have his logbook that I know the information to be wrong. I say this, because this post potentially throws up another inaccuracy regarding Ted Smith and John Mossman and the Banks crew. What follows is what individuals have told me and what I have gleaned from the ORB’s – and to put no finer point on the fact that they are utterly contradictory – however as I have already observed from personal experience with Dad, given the toss up between the ORB’s and known fact – its probably better to go with the known fact……. Now, whilst my questions have been partly answered, they have thrown up another mystery – despite the fact that John and Matt say that Ted is in the the photograph because he flew with the Banks crew – and one must assume the same for John Mossman, there appears to be no evidence of this in the ORB of this. 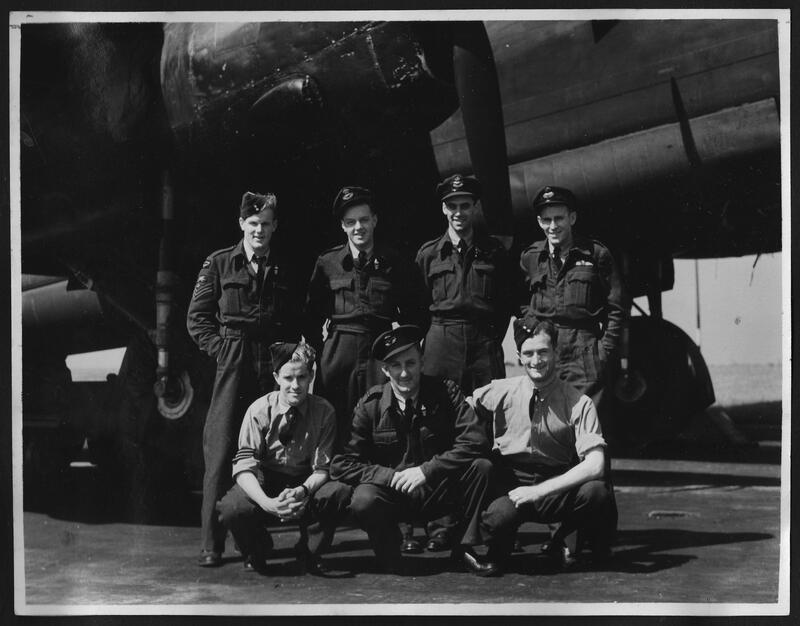 The story is further and tantalisingly complicated by a message from Jimmy Woods, Air Bomber with the Banks crew, via his son Roger, that John Mossman did fly with the Banks crew. Banks crew – Norman Allen and Jack Britnell are listed as flying in every Op with the Banks crew as Mid Upper and Rear Gunner respectively apart from in 3 cases. 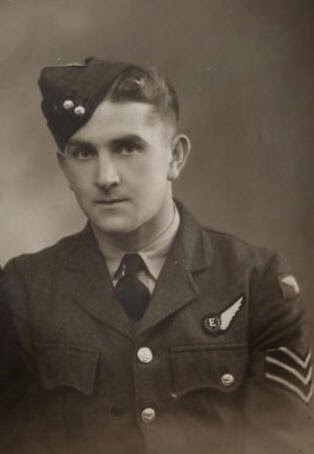 3rd and 7th of May, Jack, then Norman flies as Rear Gunner for 2 ‘Manna’ Ops (these did not utilise Mid Upper Gunners). on the 14th of May (Exodus), Jack Britnell is replaced by Charlie Carey as Rear Gunner. Milsom crew – The two ‘Johns’, Williamson and Smith, fly every Op, apart from the 2nd of May, when as standard for a ‘Manna’ Op, only Ted Smith flies, as Rear Gunner. Rangiuia crew – John Mossman flies all Ops with the crew apart from 2. These are on the 10th and 12th of May and are ‘Exodus’ flights to Juvincourt in France. On both occasions, his position as WIreless Operator is taken by Pat Wilson. Having looked at the crew histories like this, I now simply have no idea whatsoever what is going on, part from the terrifying thought that significant portions of the ‘541 are simply wrong. 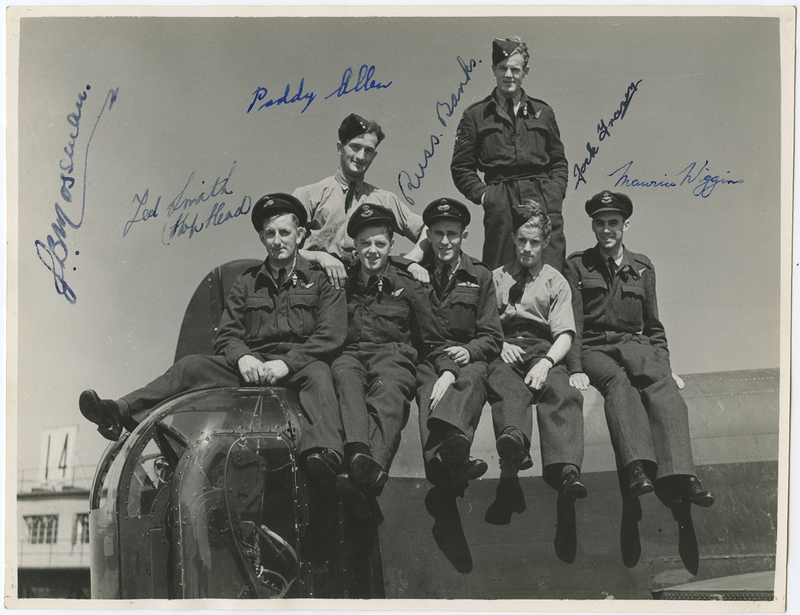 A slim chance perhaps – but Norman, Jimmy, Alex and Jack had left Mepal by the end of June – which means they simply couldn’t have been there to be in these photographs…..
Tantalisingly, Matt has passed on another crew photo that was in Jimmy Wood’s photo album, showing the boys of the Banks crew, both including Ted and John Mossman…..
Based on the ORB’s, The Banks crew flew LM276 AA-S 8 times (one occasion, incorrectly listed in the ORB as ‘D’ on the 7th May). This is the only ‘S’ the crew flew, so we must therefore assume that the aircraft certainly in the picture above is LM276. Between the 27th March (Hamm) and the 14th of May (Juvincourt), the Banks crew flew 10 Ops – 7 of which were in LM276. The only other time the crew flew this aircraft was on the 28th of February to Gelsenkirchen – the Milsom crew did not arrive at Mepal until the 6th of March. During this ’10 Op period’, the Milsom crew fly 8 times – however, there is a disparity of Ops in April – the Banks crew fly only 3 against the Milsom crew’s 5. In May, the Banks crew fly 6 times, against 3 for the Milsom crew. Whilst through absolutely no proof or argument whatsoever, it might be during May that Ted might have picked a up a few Ops with the crew – additionally, overall looking at the 2 crew’s Ops history , they appear ‘out of sync’ as it were. I have noticed that certainly towards the latter stages of the war, the larger number of crews on station seem to suggest rotated groups of aircrew, that fly as ‘sets’ on raids – these ‘sets’ seem to, broadly speaking, dovetail between each other in the Ops in the ORB. Additionally to these crew photographs, Matt has also passed on the following group training photograph taken whilst Ted was in Canada. This second photograph I think is potentially the most interesting. Ted can be seen in this picture, second row from the front, fifth from right. 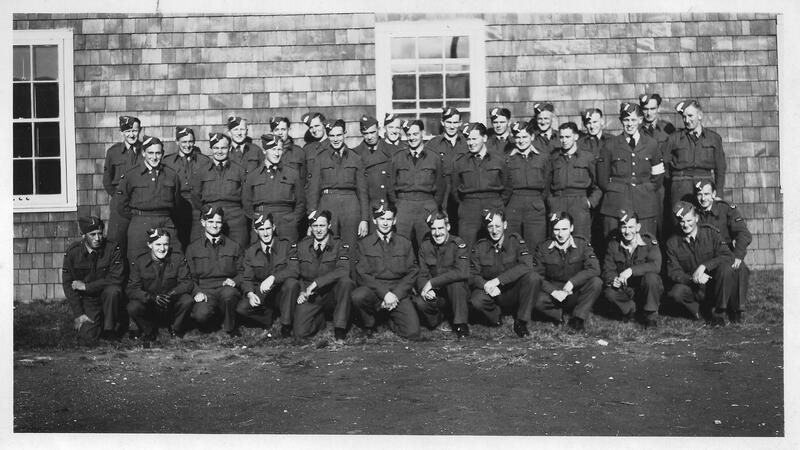 Initially I wondered if this was possibly another training group photograph, however on closer inspection, I realised that also on the second row from the front, this time fourth from left is, (I am pretty sure) Norman Allen, A/G with the Banks crew. 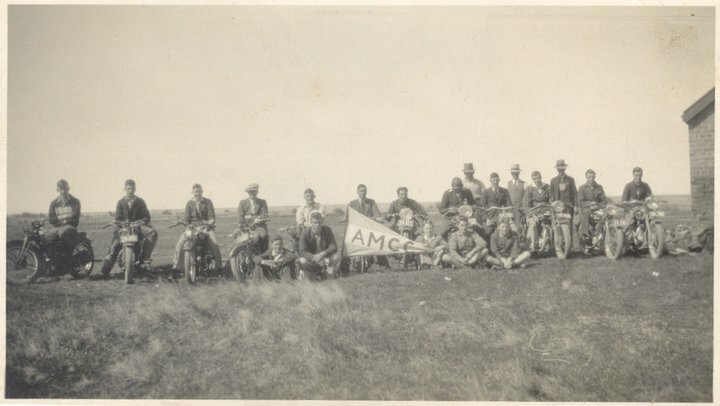 The arrival of the Milsom and Banks crew at Mepal are a month apart, so I am disinclined to believe that this is a training group photograph and that perhaps this is actually a Squadron photograph of Air Gunners from Mepal, one would assume close to the end of the war. 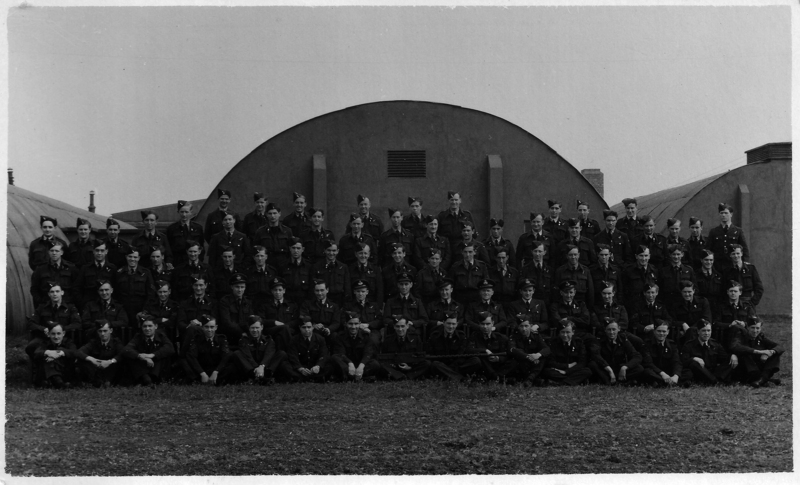 Based on a comment Chris made on the full Squadron photograph couple of weeks ago, a figure of approximately 70 crews were at Mepal by the end of the war – if one assumes that by this point the aircraft were essentially ‘double crewed’ the number of individuals in this photograph would be about right – I think……. 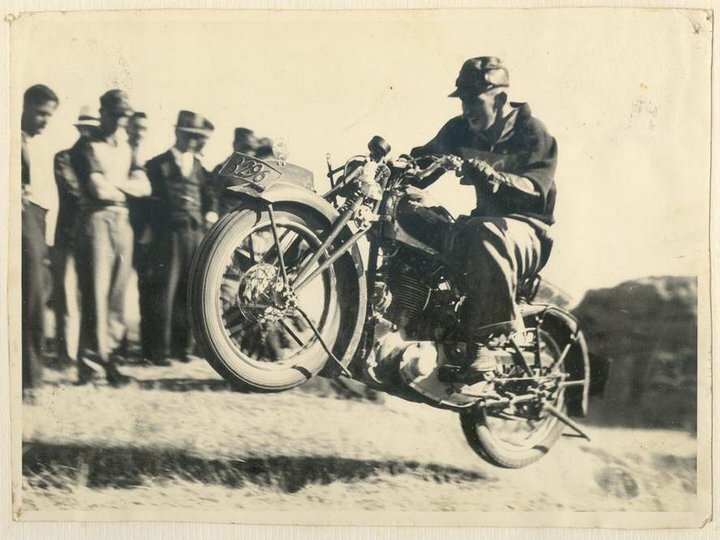 In correspondence with John, he said that Ted was a bit of a motorcycle nut. 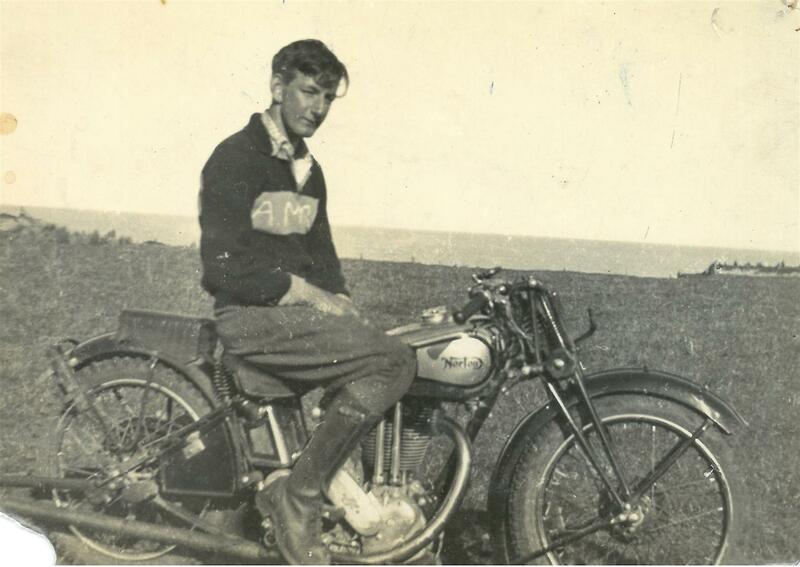 Ted was Mid Canterbury Motorcycle Club champion several years running in the late 1930’s – what would be today’s moto-cross. 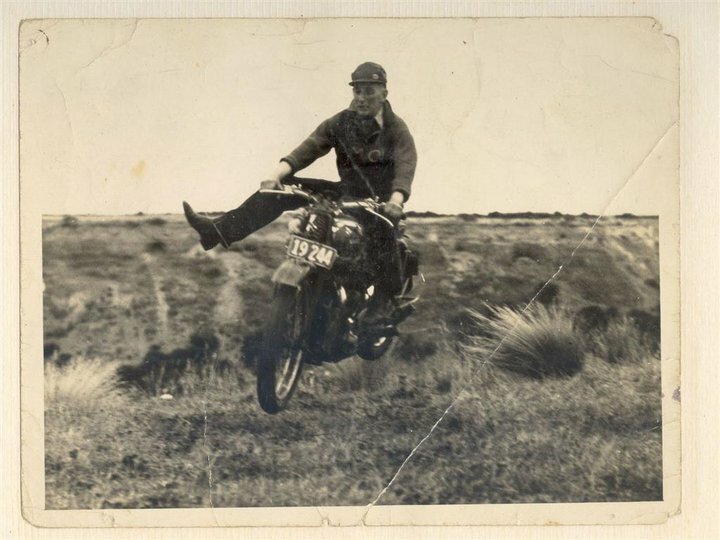 He worked as a motor cycle mechanic pre and post war. John says he certainly wouldn’t be surprised if someone has some stories about Ted and motorcycles at Mepal! So, as always, if anybody reads this and can shed light on this little conundrum, I and I am sure Matt and John, would love to hear from you. 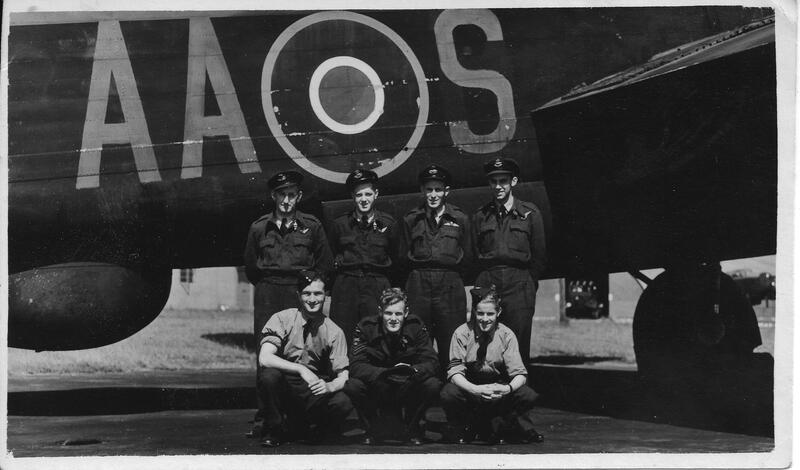 This entry was posted in general and tagged 75(NZ) Squadron RAF, AA-F, Aviation, Banks crew, Bomber Command, Gilbert Randal Springer, Jack Britnall, Jimmy Wood, Jock Frazer, John 'Ted' Smith, John Alexander Williamson, John Edward Barry Mossman, John Smith, Lancelot Osgood Waugh, March 1945, Maurice Higgins, Mepal, Milsom crew, Norman 'Paddy' Allen, Norman Allen, Paddy, Pat Hirst, Rex Baxter, RF190, Robert Sinclair Milsom, Russell Banks, Ted Smith, William (Bill) Smith, World War 2 on May 10, 2014 by 75nzsquadron.